Although the Amerimold event is primarily targeted to manufacturing companies involved in plastic injection molds, anyone interested in the advanced technology that is critical to mold machining could find useful, valuable information there. In fact, [Mark Albert] went looking for product news and application insights that would be of interest to the metalworking industry at large. There was plenty to see. 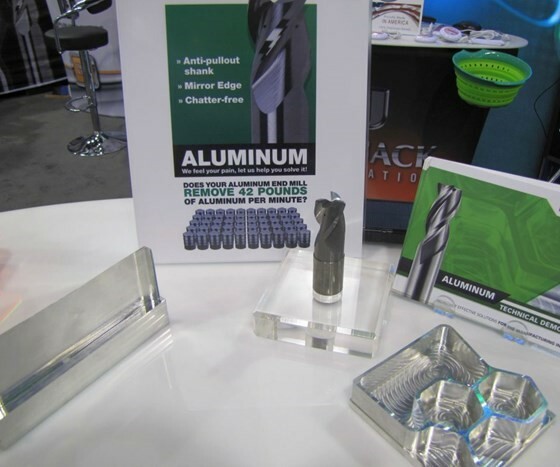 Almost all of the emerging developments and key trends in metalworking technology were represented at this show, as the highlights of [his] discoveries illustrate. RobbJack’s FM series of carbide end mills is designed for high metal removal rates in aluminum. The company says the design of the flutes induces a vibration into the workpiece to counter the tendency of the workpiece to vibrate at a different frequency. By “syncing” these vibrations, the tool cuts cleanly with no chatter, regardless of the spindle speed. The tool is always in a “sweet spot” to optimize metal removal. The company says this tool is capable of making very-thin-walled parts with a fine surface finish, as well as hogging out material from workpieces with numerous adjacent pockets.